Chauntel helping Apollo overcome fears caused by a lifetime of abuse at the hands of violent man. With deep gratitude to the inspirational generosity of an anonymous donor who pledged to fund our first-ever staff position for the first three years, we are grateful to have Chauntel Skye Gillilland as Barn Manager. 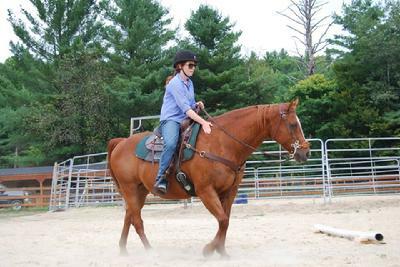 Chauntel’s impressive credentials include training and teaching at a therapeutic riding center, directing the riding program at Pok-O-MacCready camps, competitive trail riding, and showing. Her gentle, natural horsemanship techniques are perfect for rehabilitating broken bodies and broken souls. Chauntel’s responsibilities include daily chores, wound care, physical therapy, training, and rehabilitation. She also assists with education and outreach programs, volunteer management, farrier and veterinary care. Chauntel leads the Equi-Riders 4-H Club and CMVHR is the new home for the Club. It's not a riding club, but a horse hippology and horse bowl club where learning is primary objective. The rescue horses are the perfect teachers and the kids enjoy hands-on learning with them. They are great teachers and have been the subject matter for saddle fitting, leg wrapping, anatomy (the kids painted the horses, literally! ), dental and hoof care, how to take vital signs, and more. The kids working with horses also helps to make them more adoptable. Chauntel evaluates each horse to help set them up for successful placement in a new, forever home. Though the horses’ needs vary greatly, her consistent work and experience benefit every horse’s mental, emotional and physical well-being. She brings out the best in all of them. With Chauntel on board, Eddie and Nancy can focus on improvements to the facility and programs to help more horses – and people in need. We are thrilled to have Chauntel with us and deeply grateful to our anonymous benefactor who made it possible for us to be able to work with such a talented horse-person. It is with great pride that we share our status as a local employer. Until 2016, we have worked as a 100% volunteer operation. In addition to hiring Chauntel as full-time Barn Manager, we serve as a supervising site for OneWorkSource. OneWorkSource helps North Country Youth through "Work Readiness Training, Work Prepration, Work-Based Opportunities, and Youth Development Services." CMVHR provides work assignments, supervision, and mentoring to at-risk youth. OneWorkSource provides their pay and we provide the opportunity to "build work maturity and improve individual skills". We serve in the same capacity for the Youth Advocate Program. These are a win-win partnerships we look forward to continuing. With great thanks to the generous support of friends like you, we are not only going strong, we are growing. Thank you!